Click here to access the Sept. 11 blog. CBC Director of Library Services Sarah Milnarich said she wanted something in the Beeville campus library that looked realistic to commemorate the tenth anniversary of the terrorist attacks on September 11. She got sand from a local demolition site. Metal was donated from the welding department. Lanny Holland of Beeville loaned her a fireman’s helmet; CBC Law Enforcement Instructor Kevin Behr loaned a her policeman’s Helmut. The results of the Milnarich’s project, done with the assistance of Desiree’ Ortiz, a CBC student, is a large exhibit in the Grady C. Hogue Learning Resource Center foyer on the Beeville campus. The 9/11 exhibit at the Coastal Bend College Grady C. Hogue Resource Center (Library) featured the work of local artists including Mary Chaudoin of Beeville. “It wasn’t just an attack on America. It was a terrorist attack on the world,” Milnarich said. 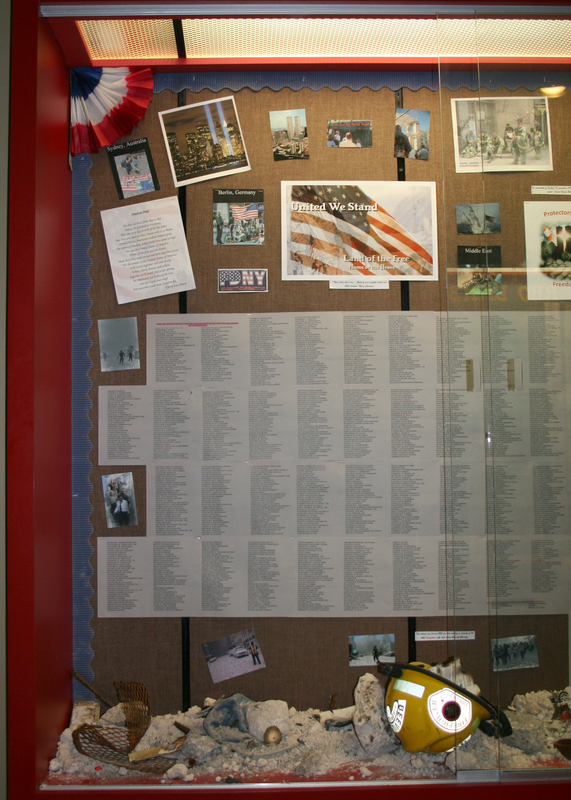 The exhibit lists the names of victims from the different sites – the World Trade Center, the Pentagon and Shanksville, Pennsylvania and honors the firemen, policemen, airline crews and passengers, and citizens of the world who lost their lives on September 11, 2001. Milnarich said the idea for the static display came to her around July 4 when she realized that the tenth anniversary was coming. Milnarich created a moving memorial that includes toys in acknowledgement of the children who died that day; foreign coins; and red beads that represent blood. Posters by local artists are also part of the exhibit which will remain at the library through September. “I asked her to repeat herself,” Milnarich said, recalling how incredulous she was. Then, she went to find a television. She wound up in the SUB with Amador Ramirez, computer information technology instructor, and Frank Anzaldua, former electronics instructor, where a television was showing news coverage. What struck Milnarich, she recalled, was that there were students playing pool, oblivious to what was unfolding. “They just didn’t realize the scope of what was going on,” she said. Ten years later, Milnarich and others still find the attack incomprehensible. Milnarich used the exhibit to feature the work of local artists like Mary Chaudoin, a graphic artist. Chaudoin created a poster in 2002 as a class project that is part of the display. She recalled seeing a transport train with soldiers dressed in desert colors headed south from Mobile, Ala. toward the Gulf of Mexico one week before the bombings occurred. “That train was going to ‘Nowheresville.’ They knew something like that was going to happen,” Chaudoin said. The Army veteran said she noticed the train and found it odd. 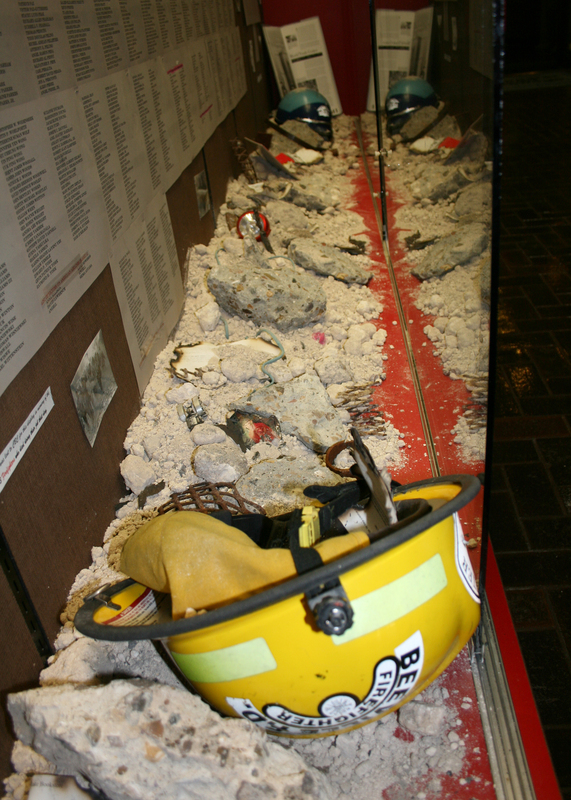 The 9/11 exhibit features elements donated by local law enforcement. Two days before the terrorist attack, Chaudoin saw that an old armory nearby had been completely refurbished with paint and repairs. This increased her concern for what was to come. She explained that though she could not imagine what was actually to take place, she wasn’t entirely shocked that something happened. Chaudoin created the poster, hanging in front of the library, featuring images that signify 9/11 to her. The five images are a policeman’s funeral, the recovery of a fireman thought to have been dead, the Statue of Liberty, and a WWI Uncle Sam Poster. The backdrop is a wallpaper pattern. The exhibit will remain throughout the month. An interactive memorial where students will be able to upload and share their memories and honor those who lost their lives will be available to students on all campuses. 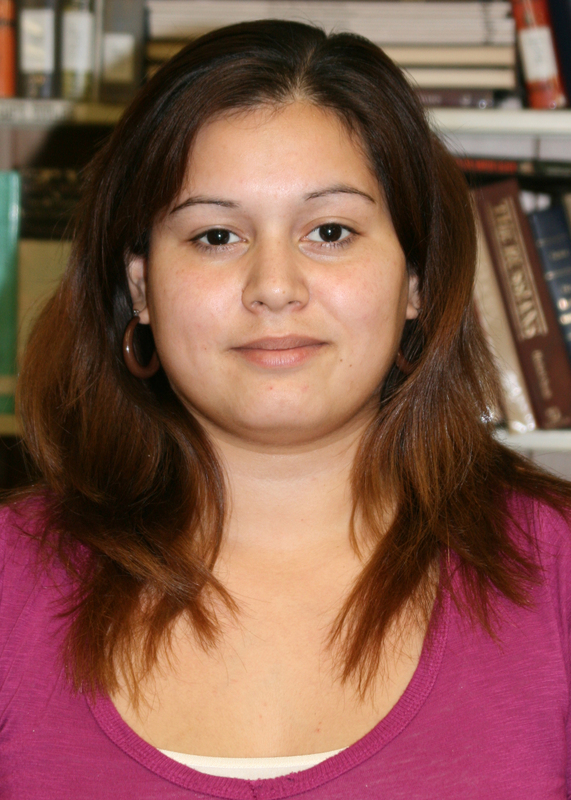 Coastal Bend College students will be able to share a commemorative blog. Everyone in encouraged to post to it. Those posts will be accessible for all to read. “This is an opportunity for students to post their memories and thoughts about September 11. It is also a tribute to the people who died as a result of those terrorist attacks,” said Jose Rodriguez, Coastal Bend College Student Life Coordinator. A memorial will be held in the James R. Dougherty Jr. Student Center (SUB) on Sept. 12, 11:30 a.m. to 1 p.m., to commemorate the tenth anniversary of the terrorist attacks of September 11, 2001. There will be a guest speaker, a video on September 11 and refreshments. The event is open to the public. All events are open to the public. For more information, contact Jose Rodriguez at (361) 354-2563 or jrod@coastalbend.edu.